Amongst all its imitations Henri Le Roux’s CBS remains unique because of its very special sweet-savoury combination and its fragments of almonds, hazelnuts and walnuts, which contrast with the smoothness of the paste. Also the Quiberon "caramelier (caramel maker)" (this is the name Henri Le Roux has taken and which he wisely registered) has never thought of making any real variations. However, in the Le Roux range of chocolates, there is a square sweet made of salted butter caramel simply covered in dark chocolate and, since 1998, a Florentine with CBS. Henri Le Roux only uses almonds of France, which he considers to be the best, for his marzipan. 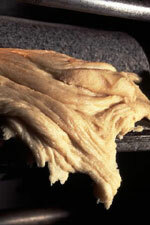 They are carefully blanched, finely ground and then worked with sugar syrup to make the light almond paste which will then serve as a base for many sweets; or, to be exact, " the base of the base" of many sweets. By then adding to the almonds other dried fruit, different spices or seasonings different marzipans are obtained: with walnuts from the Dauphiné, pistachios from Sicily or of Iran, lime, ginger or with bitter almonds and chocolate, suddenly conjuring up visions of Switzerland, the Mediterranean or an imaginary Orient. In the chocolate cream the chocolate is combined with cream, and often butter, to make what is also known as "truffle paste". It is, perhaps, the most important preparation in chocolate confectionery; certainly the one used most because it can be varied in very many ways. The presence of the cream actually makes it possible to incorporate a wide variety of flavours, infusions of herbs or spices, tea or coffee, liqueurs or fruit essences… This asset is, however, also a handicap: even when protected cream remains a fragile substance and so it is important that sweets filled with chocolate cream are carefully stored. This is an extremely useful machine even if some people avoid using it. However it is this machine, with its two or three parallel cylinders, which makes it possible to obtain the best pralines and the finest marzipans. The mixture of sugar and almonds is transformed into an extremely fine powder or a pliable paste between the metal or stone rollers. 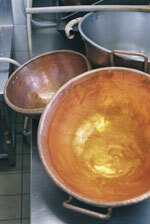 It is then up to the chocolate maker to use these textures to create an almost never-ending range of pralines. Granite cylinders make it possible to produce a slightly coarser grain, slightly finer than granulated sugar, which makes the pralines more structured. So he suggests that to get the most enjoyment out of his chocolate pralines and to savour their variety they should be sucked (slowly) rather than crunched. In this way the various ingredients exhibit their full range successively, staging their effects and offering a multiplicity of sensations to the gourmet. Not all the Le Roux family agree, however. Some bite straight into the chocolates, finding that this is the only way to enjoy the contrast and play of the textures to the maximum. How to decide between them? Well try both methods of course. 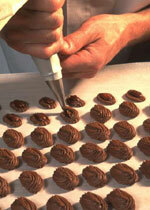 Gianduja is a variant of praline which comes from Italy, from Piedmont to be exact, hazelnut country….. But on either side of the Alps the techniques are different. Whilst the "classic" praline is prepared using sugar syrup and almonds, blanched or not according to whether a softer or coarser praline is required, caramelised together before grinding to the fineness required; gianduja is prepared using hazelnuts, sometimes almonds, grilled and peeled and then mixed with caster sugar before being ground to a fine paste to which chocolate is then added. In general the texture is more melting and the roasted flavour more pronounced whilst the praline emphasises its caramel taste.